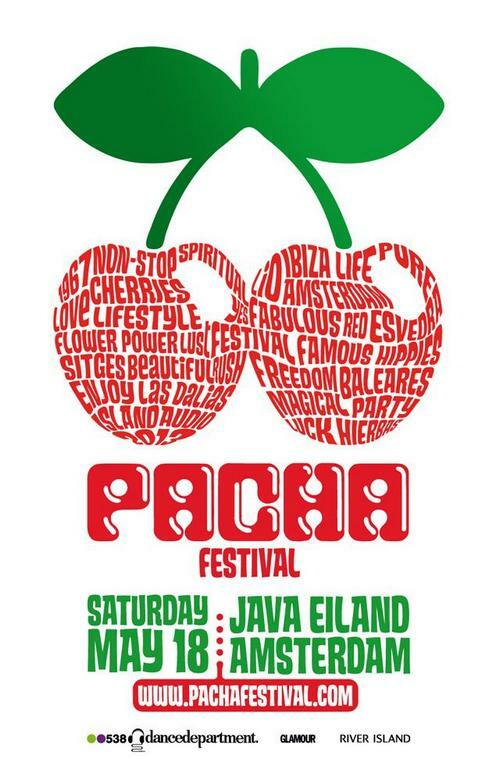 On Saturday May 18th, the world’s most well-known club brand with the two cherries will return to Amsterdam for the 2nd Edition of Pacha Festival. The special location, Java Eiland, with the city’s skyline as stunning decoration, was the ultimate place for the first ever edition of the festival. Visitors say it was a true highlight of the festival season with a wonderful setting, slamming DJ- and live sets from some of the hottest players around, the popular Ibiza hippie market and some lovely sunshine. Check out the after movie to re-live the party or see what you missed. Just like in 2012 everything will be done to make sure Pacha Festival will be a worthy opening of the summer season. A carefully selected line up, state of the art production, great decoration and true Pacha entertainment on stage. Nothing will be forgotten so you and your friends are ensured the most important factor: a great party vibe! Place: exclusively at the 538 ticketshop. Only here, will you be able to purchase your ticket with a €10.00 discount for a week. After this, regular ticket sales will start at www.pachafestival.com and all Primera shops in Holland. Every 100th ticket buyer will receive an automatic VIP upgrade for 2 persons including locker with Pacha goodie bag! Keep an eye on the Pacha Festival Facebook Page to see if you’re one of the lucky ones! It’s a fact that the different areas will offer something good for every Pacha fan, and many of the artists booked will perform regularly in the legendary Pacha nightclub in Ibiza this coming season. The line-up for Pacha Festival 2013 will be revealed step by step at the Pacha Festival website & Pacha Festival Facebook Page. Here you can also check for updates and more information.